This time it’s the X-Files donating a bunch of geegaws to the The National Museum of American History in anticipation of the upcoming movie sequel to the original tundra crapfest. 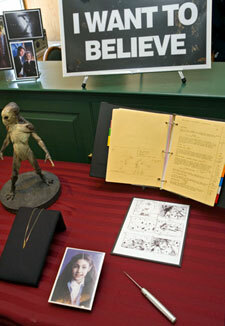 During a special ceremony today, the Smithsonian’s National Museum of American History received a collection of objects from “The X-Files,” the television series and movie franchise. Twentieth Century Fox together with Chris Carter, series and film writer, director and producer, and Frank Spotnitz, series and film director and producer, presented an annotated script from the series’ pilot episode, FBI badges, posters and other objects to the museum’s entertainment collections. A scale model of the original Enterprise it ain’t.